To most the word ‘quilt’ conjures up certain images of cosy nights in, a lovely big colourful quilt wrapped around your knees to help you keep warm on a cold winter night. However, these quilts are far from what you would commonly think of as a traditional quilt your Granny would make for you. Kirkcudbright Galleries is now exhibiting quilts that are true works of art. 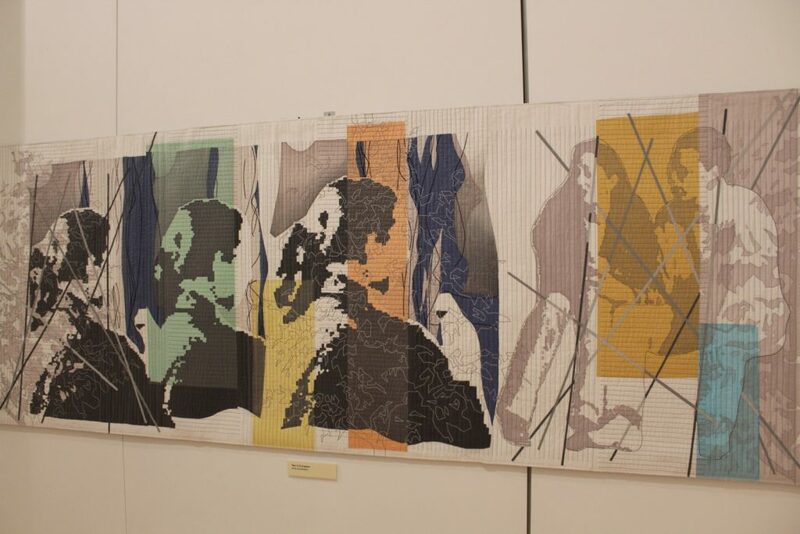 Crafted by a group of international artists and creators, The Quilt Art Dialogues is an exhibition that will subvert your expectations in the best way possible. The Dialogues were founded in Britain in 1985 as a collaboration between British Quilt Historian Dr Sue Marks and members of Quilt Art (a collective of quilt artists). The exhibition acts as a collection of works created and formed by the dialogues or small talks between Dr Sue Marks and the group have had over the years culminating in this celebration of their works. Quilt Art aims to extend the boundaries of quilting as an artform to raise awareness of the artistic merit in quilting itself. Its members include professional quilt artists from Great Britain, Ireland, Belgium, Denmark, Hungary, The Netherlands, Germany and the USA. Each member brings a distinctive approach and the work is diverse, dynamic and sometimes challenging. The group also has close ties to Kirkcudbright itself. Sue Hotchkiss who is a member of Quilt Art is related to Anna Mary Hotchkiss, an artist that lived and worked in Kirkcudbright (1938-1984) and was closely associated with Jessie M King and other Kirkcudbright artists. Kirkcudbright Galleries have been delighted with the reception to the exhibition so far receiving many positive reviews from members of the public. To accompany Quilt Art dialogues exhibition, Kirkcudbright Galleries are also putting on a number of quilt related workshops and a talk from Ann Hill a Coordinator of the Quilters Guild of the British Isles and quilter in residence at Alzheimer Scotland. Ann will be hosting a free talk titled “Making memories through quilting” on 16 February from 11am to 12.30pm on the mezzanine level. Entry is free but donations towards Alzheimer Scotland will be accepted. Places for the talk can be booked through Kirkcudbright Galleries Website as well as upcoming announcements for the series of Quilting workshops. Admission to Quilt Art Dialogues is free and on display Tuesday to Sunday from 10am to 4pm. The exhibition is running throughout February until 24 March.